The Boat Oregon Initiative touches on six of the eight in-scope activities of the Administering Change project for the agency’s Strategic Plan and incorporates the accomplishments and lessons learned from some of the other projects; namely the technology strides made by the Web User Group, the successful problem-solving and collaborative processes illustrated by the recommendations being produced by external advisory committees (Rules Review and Non-Motorized). Many of the attributes of “Boat Oregon” are already underway, but thus far have lacked an overarching branding structure that this initiative can achieve. With “Boat Oregon” as the overarching brand, communication is unified to create an engagement infrastructure for real-time information to boaters and multiple feedback options from boaters that will facilitate an ongoing two-way dialog, ultimately helping inform staff and members of the Oregon State Marine Board (OSMB) on what boaters need. 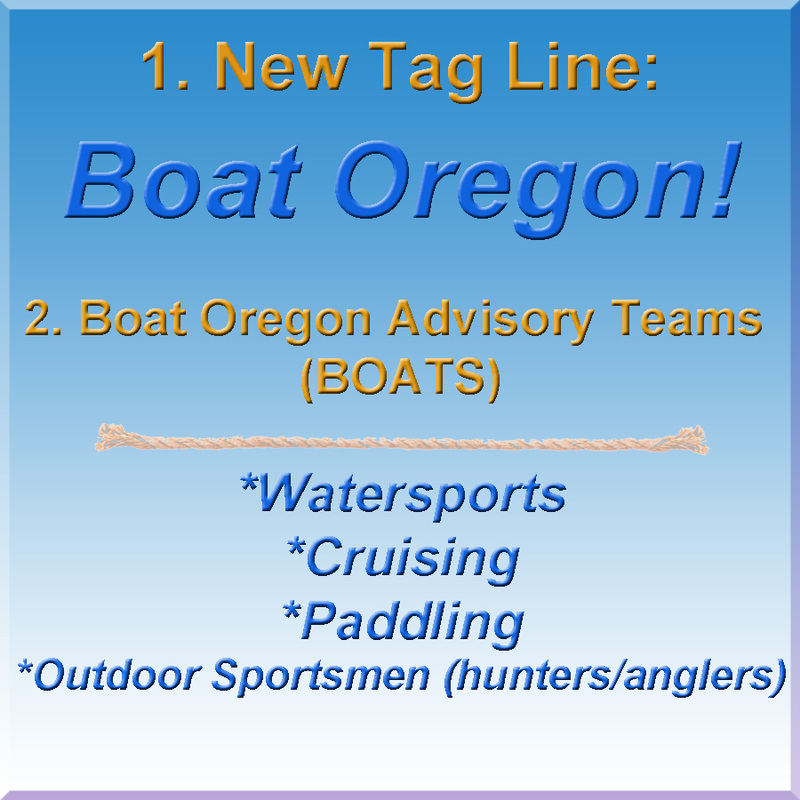 Boat Oregon becomes the agency’s new “tag line,” incorporated onto all printed and digital material. The newest and most staff-intensive attribute of Boat Oregon will be establishing standing advisory teams as a way to continue to engage in a two-way dialogue, to strategize OSMB activities for these user groups as they relate to our new mission of “Serving Oregon’s recreational boating public through education, enforcement, access, and environmental stewardship for a safe & enjoyable experience.” BOATs serve as an acronym for “Boat Oregon Advisory Teams” and will expand existing advisory committees to include all boating user groups as part of this initiative. Watersports – Wakeboarding, waterskiing, PWC, Sailboarding, racing. (Sponsor and Coordinator TBD by Director). Cruising – Yachting, Sailing, Runabouts. (Sponsor and Coordinator TBD by Director). Outdoor Sportsmen –(Sponsor and Coordinator TBD by Director). Sponsors will be designated by the Director and selected based on their knowledge base on the subject matter. Sponsors will provide semi-annual debriefing to the Board, will determine agency action items, monitor completion of BOAT and agency action items, determine content for each meeting, and serve as agency representative at meeting. An internal agency application form will be created to allow all agency staff an opportunity to serve in Coordinator roles and will represent project management opportunities for staff members. The Coordinator will work with the sponsor to schedule meetings, prepare agenda and supporting documents, and facilitate meeting. The BOATs (Boat Oregon Advisory Teams) are a product of the successful collaborative processes established by the external advisory committees. By expanding external advisory committees, their input and active engagement can provide direction and counsel to the Marine Board on issues from their boating activities’ perspectives. It’s recommended that committee meetings be held semi-annually, with occasional teleconference meetings for the purpose of discussing any emergent matters, such as rulemaking and legislation. Each BOAT will be faced with a myriad of issues, and it will be up to each team facilitator to channel discussions back to the statutory obligations of OSMB of; reducing conflict, improving safety, and furthering education. Where BOAT issues overlap that may impact multiple user groups, “BOAT Issue Summits” can be coordinated to bring all of the committee members together to discuss and develop a strategy in one venue. Issue Summits are also a key Administering Change in-scope activity. April, 2014: This proposal will be brought to the Board at the April 22-23, 2014 Board meeting. May – Jun, 2014: A public information and solicitation process will be held with an application due date of the end of June. October, 2014: The first BOAT meetings will be held. We’re getting to work and expect to see Boat Oregon integrated into all media and publications, communications, and outreach/marketing efforts! BOATs will help set policy and other issues into action items for Marine Board consideration -making YOUR Oregon State Marine Board effective, efficient and adaptive -representing all boaters in the state.